Okieladybug's Scrap N' More: For the love of Penguins!! My daughter has fallen in love with penguins since seeing the movie Happy Feet. I found the cutest stamps at my LSS and of course with her being with me I had to get them (she didn't have to twist my arm much though). Inspired by the stamps I thought I would see what I could come up with as a cut file with Design Studio. 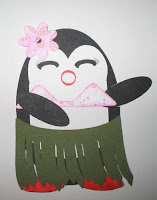 I did some tweaking after cutting the cut girl penguin so it should cut right now. You will have to draw on the eyelashes and also clip the ends at the top of the skirt for it to fit right. I did get the boy done also but I don't have it cut yet. You can refer to the stamps as for placement of objects. As you can see the Penguin Girl is doing the hula! The Penguin Boy is holding a Popsicle! The only bad part of making these files is that my daughter said "Can you make them bigger?" I told her "yeah". She said "Good I want to redo my room in penguins, I want a new comforter, paint my walls, and other cute things to go with it". These cute 99 cent stamps are likely going to cost me a couple hundred bucks! (She is 16 now, two more years and she is out of here....hhmm, wonder how much money I will save once she moves out). Those are so adorable! I love penguins! I love your blog too! Thanks Lynn! I just fell in love with the stamps and thought they would be easy to do with the cricut using DS! Okie these stamps are great! I love what you did with it! I have them too so I'm going to have to try them. I just found these on your blog. I am in LOVE with those penguin stamps and the matching paper!! I can't believe you made a .cut file that long ago and I never noticed. I'm in heaven! You are the BEST! !